Arnold Machine Inc. announces the launch of FilterMatic, an automatic machine for processing used automobile oil filters, FilterMatic is designed for quick lube operators, service shops, and used oil recycling centers to easily and efficiently maximize the recycling potential for used oil filter material. The company is offering a no-obligation 30-day trial of FilterMatic for all new customers (details at http://www.filtermatic.net). removes and collects the steel base plate from the filter. crushes and extracts used oil from the filter. collects the resulting steel, filter, and used oil for proper recycling or disposal. FilterMatic enables quick lube and auto service shop operators to meet or exceed environmental standards for used oil filter disposal while enabling shop owners to earn income from the sale of the filter metal. Steel collected from the filter can be sold. "The automobile service industry is becoming increasingly aware of their need to be proactive about the proper disposal of used oil filters to protect the environment. 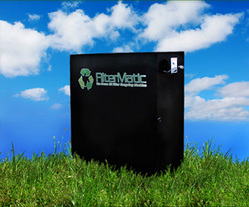 We designed FilterMatic as an extremely proactive solution to maximize the recycling potential for waste material that results from a typical oil change," explains Zach Arnold, President of Arnold Machine and FilterMatic. "Even more, we see FilterMatic as a way for oil change operators to position themselves as environmentally-responsible in light of greater consumer awareness and preference for 'green' companies." FilterMatic was successfully introduced last month at the annual Automotive Oil Change Association (AOCA) trade show and has since been invited to attend the 2009 annual invitation-only Jiffy Lube Convention & Trade Show. FilterMatic is offering a no-obligation 30-day trial of its used oil filter recycling machine for all new customers. Details about this offer can be found at the FilterMatic website. FilterMatic is a patented automatic machine (Made in the USA) that enables the safe and efficient disposal and recycling of automobile used oil filters, while generating income from the reclaimed materials and goodwill in the minds of customers. In relation to alternatives, FilterMatic is easier to use, more efficient, and provides a more holistic approach to used oil filter management. Arnold Machine Inc, maker of FilterMatic, is a full-service designer and manufacturer of high quality, innovative automated equipment and industrial services. The company has introduced FilterMatic as a way meet the rigorous environmental standards being put in place for proper disposal and recycling of used automobile oil filters.